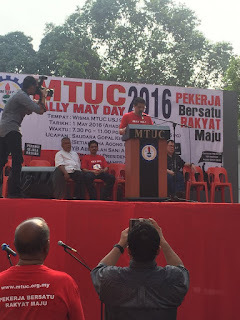 The Malaysian Trades Union Congress (MTUC) acting president Abdullah Sani Abdul Hamid today reminded workers that May 1 was not just another public holiday, citing the bloody origins of the annual global ‘May Day’ celebrations. “I urge all workers to realise that today (May 1) is not just another holiday. This is a very important day for workers. “We should always remember what happened in Chicago in 1886…this is a day for workers to show solidarity with those who had died fighting for our basic rights,” Abdullah Sani told reporters when met after the MTUC May Day celebration at its headquarters in Subang Jaya. The Kuala Langat MP said this when asked for comment on the gathering’s poor turnout, numbering only approximately 200 workers. The workers represented, among others, the National Union of Flight Attendants Malaysia, National Union of Bank Employees, as well as the National Union of Transport Equipment and Allied Industries Workers. On May 1, 1886, thousands of Chicago unionists, reformers, socialists and ordinary workers had initiated a strike in support of their demand for an eight-hour work day. A bomb blast at the site later resulted in the deaths of policemen and protesters. Internationally known as the Haymarket Affair, the incident inspired unionists from around the world to commemorate May 1 as a day to mark the struggle for workers' rights. Earlier in his speech, Selangor menteri besar Mohamed Azmin Ali also cited the need to emulate the spirit of workers involved in the Haymarket Affair. “They did not bow down to tyranny. They did not bow down to pressure from the government. They were protesting the exploitation of men by men (employers exploiting workers). “In this day and age, we should never allow any man to exploit another man. MTUC should not allow any party to exploit workers for their own benefit,” said Azmin. This year’s May Day Rally is held in the backdrop of major layoffs across various sectors, a situation attributed to global economic uncertainties. Abdullah Sani, however, said that all workers who believed that they have been unfairly laid off can try to seek assistance from MTUC - even if they are not members of any union. “MTUC can represent any worker, even a CEO. There is actually no need for Malaysia to have a Trade Union Act. “I have always said that the Act is a discrimination to workers in the country because the International Labour Organisation (ILO) recognises the rights of all workers to form and be a part of a union,” he said. In its May Day Declaration, the MTUC also raised concerns over the rising cost of living and over-dependency on foreign workers.